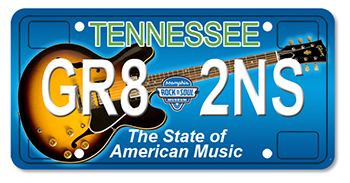 Gibson Foundation News - Finally, a License Plate Which Properly Brands Tennessee as "The State of American Music"
as "The State of American Music"
No U.S. state even comes close to Tennessee's musical significance and global influence. From the Mississippi River through "Music City, U.S.A." to the Appalachian Trail, the sounds of Tennessee's blues, rock, country, soul, rockabilly, bluegrass, R&B, gospel, and other musical influences have changed the cultural complexion of an entire planet. Until now, however, unless you are an Elvis fan, a purple cat playing a saxophone offered the only musical option to rock your car's bumper. All that changes as The Memphis Rock 'n' Soul Museum and the Gibson Foundation unveil a new specialty license plate which properly promotes Tennessee as the most musical state in the nation. The plate also becomes the very first to specifically benefit music education for Tennessee's students. Proceeds from specialty plate sales will benefit music education initiatives led by Tennessee music museums and charities, including the Memphis Rock 'n' Soul Museum which gained authorization for the plate from the Tennessee State Legislature. The Gibson Foundation will assist in the distribution of proceeds to other music museums and music education initiatives throughout Tennessee, including the Country Music Hall of Fame, the Birthplace of Country Music Museum in Bristol, TN, and others. The Memphis Rock 'n' Soul Museum and the Gibson Foundation are both 501(c)3 non-profit organizations. License plates are available for pre-order by mail or online (www.tnmusicplate.com) for $35. Once 1,000 plates are pre-ordered, the Tennessee Department of Transportation will begin production. "Pride in Tennessee's musical legacy runs statewide and is unequalled," says David Berryman, Gibson Guitar Corp. President. "This license plate offers a great way for Tennesseans to provide critical music education to students throughout the state, and a great way to promote Tennessee's unique, world-recognized musical prominence. Gibson Guitar Corporation and the Gibson Foundation are proud to support this statewide display of musical pride." John Doyle, Executive Director of the Memphis Rock 'n' Soul Museum concurs, noting, "No car driving the roads of the 'Home of the Blues,' the 'Birthplace of Rock 'n' Roll,' or the 'Country Music Capital of the World' should be condemned to a plain, pale green license plate!"